LePage wins federal approval to eliminate or reduce coverage for more than 14,000 Mainers to save $4.5 million of $23 million in targeted cuts. AUGUSTA — The U.S. Department of Health and Human Services has issued a split decision on Gov. Paul LePage’s plans to eliminate health insurance for some low-income Mainers in the hope of cutting state spending by more than $20 million. In letters sent Monday to the LePage administration, the Obama administration rejected the governor’s request to cut Medicaid insurance for low-income 19- and 20-year-olds. It also spurned a request to cut health insurance for parents earning less than 133 percent of the federal poverty level. DHHS did approve the governor’s request to deny prescription drug coverage and health care to some elderly and adults with disabilities receiving Medicaid. It also approved a cut that removed health care for another group of adults earning between 133 percent and 200 percent of the federal poverty level. The approved federal waivers allow $4.5 million of $23 million in targeted cuts, according to the Legislature’s nonpartisan Office of Fiscal and Program Review. 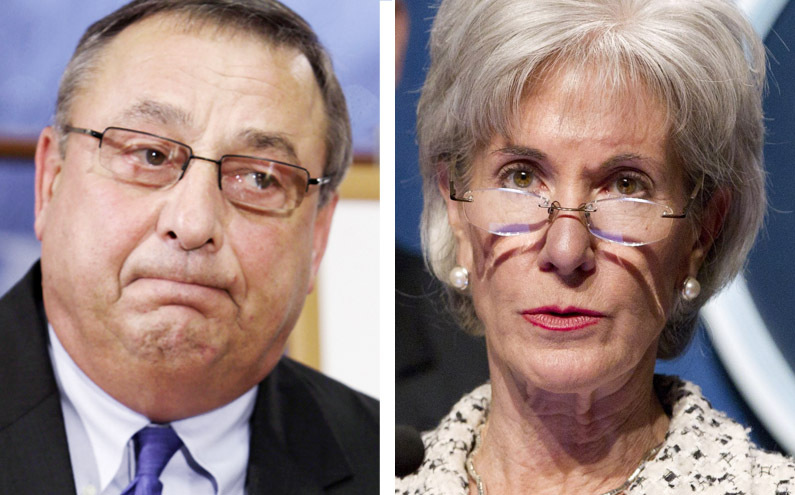 The LePage administration had asked DHHS Secretary Kathleen Sebelius for federal approval to help balance the current two-year budget ending June 30. Still, lawmakers face a $95.5 million funding gap for the state’s Medicaid program, MaineCare. The low-income advocacy group Maine Equal Justice Partners has estimated that the federal decision will eliminate health care coverage for 14,000 adults and eliminate or reduce coverage for 5,600 seniors and people with disabilities. An estimated 14,500 parents and 6,500 19- and 20-year-olds will retain their current health care coverage. The reductions were passed by the former Republican Legislature to bridge a state budget shortfall. Opponents argued that several of the cuts were illegal under a provision of the Affordable Care Act that sets minimum coverage levels for Medicaid. The Legislature, on a Republican party-line vote, used some of the cuts to book budget savings in a supplemental budget, thus initiating a protracted public dispute between LePage and the Obama administration over whether the cuts should be approved. The proposal to eliminate coverage for parents above 133 percent and 200 percent of the federal poverty line was supported by two-thirds of the Legislature in separate budget bill. The cuts were supposed to go into effect Oct. 1, but the federal government didn’t rule on them until Monday. U.S. Rep. Chellie Pingree, D-Maine, also engaged in a public debate with LePage over the legality of the cuts. On Tuesday, Pingree said the Obama administration did the right thing. “Especially in this weak economy, now is not the right time to pull the rug out from under people who are struggling to get by,” Pingree said in a statement. Pingree was disappointed that two of the cuts were approved. The LePage administration was expected to release a statement about the cuts on Tuesday. Pingree is married to S. Donald Sussman, the majority owner of the Portland Press Herald, Maine Sunday Telegram and other MaineToday Media publications.